My name is Posy Gentles and I’m a gardener and garden-designer who restores and revives gardens. I can advise you on what’s worth keeping, what can be added and what needs taking away. From a bare patch of earth, I can make a garden that’s right for you. My work is mainly private by word of mouth. I’ve advised on a number of small town gardens including the complete redesign of the very elegant Art Deco garden of a 1920’s villa, and the restoration of an Arts and Crafts garden, whose red-brick walls, topiaried yews and tumbling roses had almost vanished under brambles and ivy. 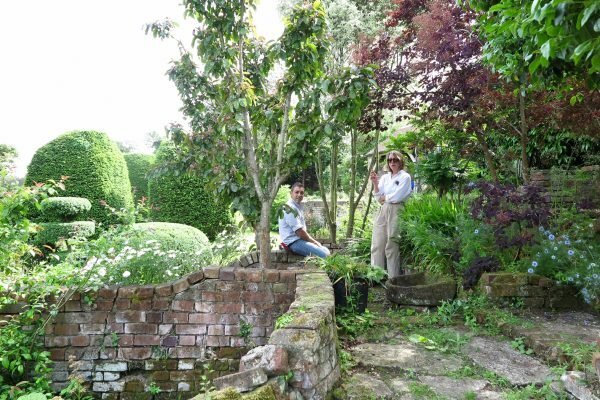 I am managing the restoration and renovation of a 3-acre 12th Century priory garden, reshaping overgrown yews and throttled, leggy roses, replenishing borders. I also work at the 10-acre garden of Doddington Place which opens to the public in the summer. Very often a garden doesn’t need a complete redesign; it just wants life and sparkle. Judicious pruning of small trees and shrubs bring light, texture and definition into your garden, without sacrificing height and privacy. I redefined my pruning technique in Normandy where I learnt “La Taille de Transparence”. “Transparent” pruning is practised in the gardens at Le Vasterival to create scattered light through the canopy of the many trees in its swooping vistas but translates perfectly in small town gardens where every inch of the garden, up or down, matters. It means that privacy and light can exist together. Sometimes it is a border which is starting to look stodgy and bleak that simply needs a fresh eye and refashioning to lift the whole garden. My planting plans are created from a lifetime’s obsession with planting combinations. My knowledge and experience of plants and their habits is extensive and various. If your garden needs brightness and dash, I can do a planting plan for a single bed, redefine and lift your small trees and shrubs, or redesign the whole garden. An exquisite range of shapes, colours and varieties.